Actually got a chance to play today! lot of fun. I couldn’t get rearming to work as an interceptor in the bay i spawned in. I went back after i’d used up my ammo, turned the pad green and all that but couldnt get repairs or bullets back. Not sure, i did have plenty of money too in case that could have been an issue. Tried landing and powering down and stuff, nope. General game flow still feels a bit too offense focused, but yall already know and things like station shields aren’t in yet. I also still think time to kill is a bit too short, feels like health could use a doubling on interceptors. The giant green sphere from the resupply field is way too visually obstructive as an effect. What if it’s just a thin green outline of the area instead of a gradient? 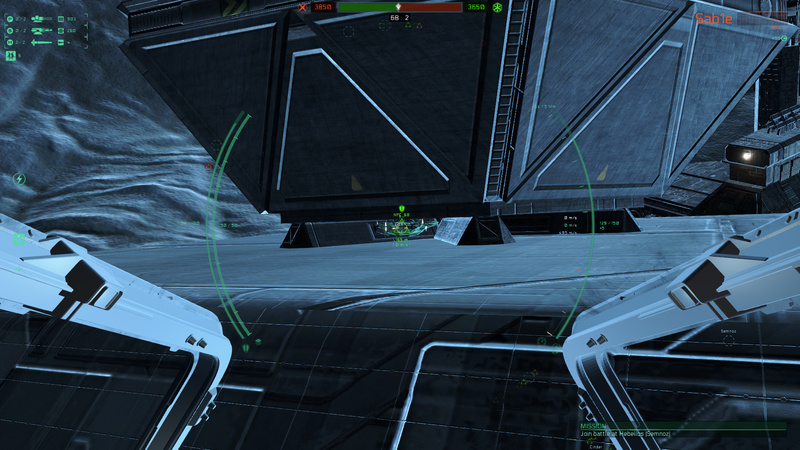 One thing I noticed is that other ships can ram the carrier and it starts to move somewhat easily, disabling spawning. Maybe the moveability by other ships bumping into it should be reduced a bit. Really liking this patch, particularly the repair/rearm zones. I spent some time zipping out of a station, killing a couple of interceptors, then running back to the hangar. I’m still at a bit of a loss as to how to locate enemy haulers. Can anyone give me a hint? I’m not sure stations are generating enough NPC defenders (something to do with the AI controller?). 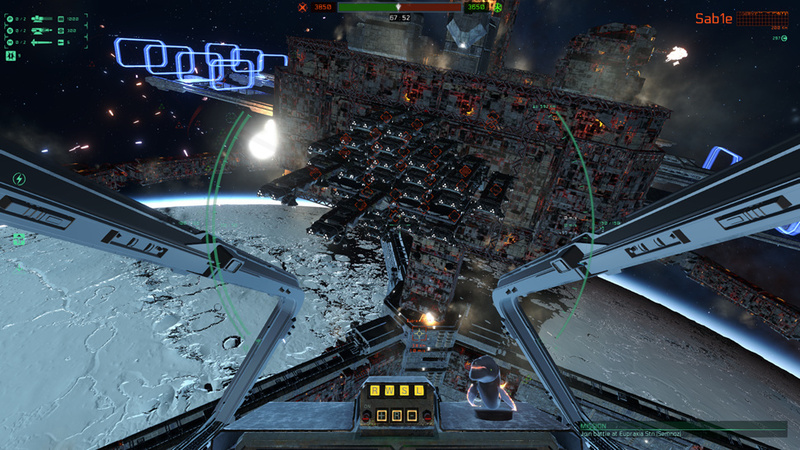 It seems far more common to see a swarm of enemy interceptors attacking your station with regular reinforcements, yet defensive reinforcements don’t seem to appear enough to balance them out. Fair enough to give the attackers an opportunity. We’re relying on NPCs to fill out the game at the moment and currently it’s quite difficult to defend as you’re often solo. Agree about the corvette sphere of influence. I would even remove the visual completely and replace it with a HUD alert only when in range of a corvette, and perhaps a hint to use the Match Velocity function. We could remove the green aura on your own corvette, but keeping the aura for other allied corvettes. Otherwise in the middle of a battle it’d be hard to figure out where ally corvettes are. We’re also probably going to fade out the effect when you get at closer range ( so the aura only appears when you’re far away from the corvette ). Jan had made an alternative effect a couple days ago, which I think could be used for the “being affected” effect. We’ll give it a try for next patch. Tried landing and powering down and stuff, nope. Actually powering down for repairs sounds like a nice suggested feature. I mean otherwise two corvettes side by side may get too tough to defeat as they repair each other. I couldn’t get rearming to work as an interceptor in the bay i spawned in. I went back after i’d used up my ammo, turned the pad green and all that but couldnt get repairs or bullets back. Are you sure it was an interceptor spawn ? In the fighter hangar bay ? Not the corvette’s ? The type of hangar has to match your ship type: interceptors + bombers in the fighter hangar bay ( the one that has 6 pads ); corvettes in corvette bays ( 2 pads ). And docking bays for capital ships. If the type mismatches, it might still show up as green but it won’t repair/rearm. I should probably not turn the pad green if the type doesn’t match. 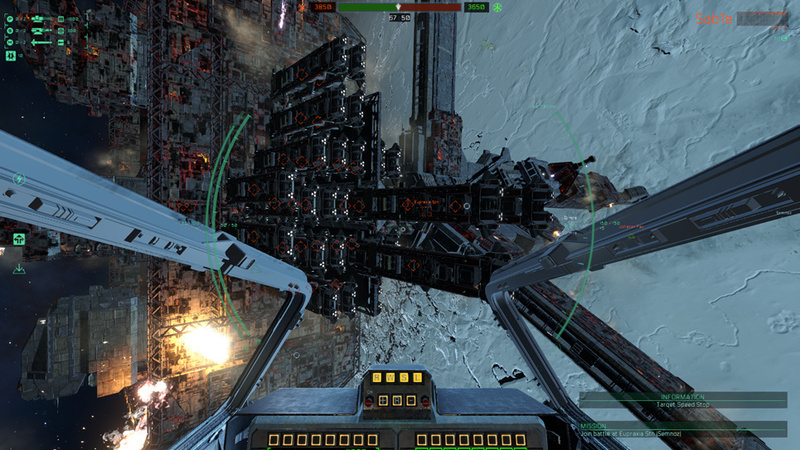 Another hint: make sure your ship is completely inside the pad, and not half-way intersection it. Ok here are my thoughts on this update. Amazing. Make small ship attacks comparable to small ship defence and quite a bit more fun by reducing downtime a lot while not feeling like cheating. The vulnerability is right there after all. I really like the visual effect in itself. The gradient with the periodic disturbance looks really cool. Yes it has some visibility problems. Is there a way to have the effect modify the background light instead of being emissive in itself? I like the obviousness of the auras. It’s really important to see where you have to fly. Having to cycle trough targets to find a corvette would be ridiculous. Anyway. This also reduces downtime by a lot as well as not making you feel like helpless and useless once you ran out of ammo or are low on health. You have a plan. Find a corvette and get near to it. Changes up the gameplay from constantly having to attack while making you care about your teammates a bit. Same here. Doesn’t make you useless in bigger ships and gives another option for them and smaller ones. Spawn markers should switch to red when not at correct spawn. Maybe generate a message too. The takeaway for both Supply Auras and Resupply spawns is that they reduce downtime … downtime that wasn’t really useful for anyone. If you run out of ammo and there are enemies … they kill you and you respawn. No downtime. But if there are no enemies … you get downtime without any real purpose. Having to kill yourself and fly back to your undefended location … just wasting some time and credits, credits that don’t really hurt because you are completing objectives easily. Now later on it may be problematic with infinite resupply. A whole supply chain could be built up though with supplies not being free and having to be ferried around. Giving the enemies chances to cut the line at different points or when ships need to go get more supply. Other ships tend to still bounce a lot … kind of seemed like teleporting but I need to investigate more. The change has introduced some new behaviour. I get knocked off course when a big error correction happens. Like after a screenshot or just in general. Instead of continuing in a straight path I sometimes turn up to 20 degrees. Same with collisions which also create many error correction. I guess it might be a small input that gets amplified by being repeated in the time where there is missing info. Namely inconsistent weapon fire. Especially with the interceptor when I hold down the fire key it fires very inconsistently. Sometimes (since 0.3.0.0 often) adding a small about 1/10 second (or more) pause or feeling quite uneven. I have a good sense of beat/measure and it annoys me quite a bit. Great patch. The match we played yesterday was a lot more fun than anything before. That’s quite a good result. Umm… I found the HAULERS (edited) doing something really weird!! Maybe they’re having a party? Yup, those are haulers ( not carriers ) and they’re having the time of their life due to path finding at their destination, when they start to run into each other. It’s one of my top priorities to fix for the beta WE.